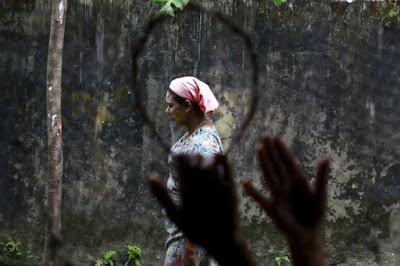 SITTWE, Myanmar -- Noor Bagum would have liked to have voted for Aung San Suu Kyi's National League for Democracy (NLD) but, like the majority of Myanmar's persecuted Rohingya Muslim minority, she took no part in the historic election the Nobel laureate won by a landslide. Stripped of their right to cast ballots by the current government, many Rohingya now hope that, with the NLD able to rule largely on its own, a Suu Kyi-led government will work to restore their lives and many of the rights they have lost. "I hope that things will get a little bit better," said Noor Bagum, a 28-year-old mother-of-five, whose village was destroyed during violence between Buddhists and Muslims that swept through Myanmar's western Rakhine State in 2012. Dealing with the Rohingya will be one of the most controversial - and unavoidable - of a long list of issues Suu Kyi will inherit from the current government. Feted by many in the West for her role as champion of Myanmar's pro-democracy movement during long years of military rule, she has been criticized overseas, and by some in Myanmar, for saying little about the abuses faced by the group. When an NLD government takes power in March, she will come under mounting international pressure to take a definitive stance in their defence. But speaking out for the Rohingya would carry a political cost at home. The group is widely disliked in Myanmar, where they are seen as illegal immigrants from Bangladesh - including by some in Suu Kyi's party. She risks haemorrhaging support by taking up the cause of the beleaguered minority. The NLD also faces a powerful local rival - the Arakan National Party (ANP) - that has been accused of stoking anti-Muslim sentiment and has called for the deportation of Rohingya. The ANP won most of the 29 national level seats in Rakhine and took decisive control of the state's regional assembly. "We'll be damned if we do, and we'll be damned if we don't," said Win Htein, a senior NLD leader, adding that standing up for the Rohingya would give the ANP "ample reason to criticize the NLD". Although many have lived in Myanmar for generations, the Rohingya are not one of the 135 ethnic groups recognised under the country's citizenship law and are thus entitled to only limited rights. Many Rohingya held temporary citizenship documents, known as "white cards", that allowed them to vote before they were nullified by President Thein Sein this year. "We won't be able to solve the problem as long as the international community is supporting and standing for the Bengalis," said ANP vice-chairman Phone Minn, using the government's term for the group, which insinuates they are illegal immigrants from Bangladesh. Phone Minn was elected to a Rakhine regional parliament seat on Sunday. Noor Bagum, and thousands of other Rohingya are now kept as virtual prisoners outside the state capital of Sittwe in refugee camps like Thae Chaung, a dusty sprawl of listing bamboo huts covered with patchworks of tarps and relief agency rice bags. "This time, we would have voted for the NLD," she said, a sentiment widely reflected across the camp. So far, the NLD has offered little in the way of concrete policy that would tackle Rohingya citizenship status or their resettlement and integration back into the communities they were forced to flee. But the first post-election comments by the party's senior leader Win Htein on the 1982 Citizenship Act that denied Rohingya full citizenship rights showed that their hope may be justified. "It must be reviewed because it's too extreme...review that law and make necessary amendments so that we consider those people who are already in our country, maybe second generation, so they will be considered as citizens," Win Htein told Reuters. Win Htein said that he wanted the NLD administration to allow the Rohingya to settle anywhere in the country to "lessen the burden on Rakhine State". It was not clear if Win Htein, one of the most influential politicians in the party, was speaking on behalf of the party or giving a personal view. ANP's Phone Minn has a different view. He said that the law was "the solution". "If they followed that law, the problem will be solved...if these Bengali people deserve citizenship according to the law, they can get it," said Phone Minn.
Suu Kyi has never visited the refugee camps that house some 140,000 people, mainly Rohingya. Still, many believe her government will be more sympathetic than the outgoing Union Solidarity and Development Party, which was created by the country's former junta and led by retired military officers. Mohammed Solim, 32, who like many camp residents was angry at being deprived of the right to vote, said: "We hope that since the NLD won, we will get freedom."